As I’ve said on a few occasions, I’ve really not been getting out walking as much as I used to. The excuse is that I’ve just been too busy this year. But that’s really not good enough. 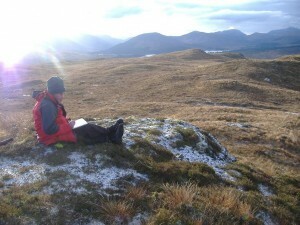 I’m getting unfit and I rely on the walks for the information needed for my paintings. So then, about a month ago I decided I’d have to make a real effort to get out again on a regular basis. This started with the walk over at the wind farm. The last week we travelled over to the Pentland Hills outside of Edinburgh and yesterday we went up for a walk on the edge of Rannoch Moor. This walk far from being a major undertaking was a simple wander up a gentle broad grassy ridge to its high point, Ghlas Bheinn at 501m. It was also always within 1km of the main A82. But that’s where boring stuff ends. This was a truly spectacular little walk in some of Scotland’s finest scenery. 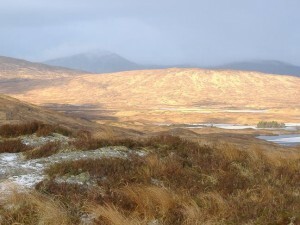 This little ridge, rising high enough to offer big views, is situated amidst a vast array of hill, mountains and lochs. We were looking down on the main road so familiar to us ….and suddenly it looked very small against the vastness of Rannoch Moor and the hills of the Black Mount. This day though, wasn’t just about walking and trying to get some fitness back into aching leg muscles, it was also about trying to get some new information for paintings. The forecast was for dry and clear weather, but as we arrived there was much dark cloud with just a few bright breaks and flurries of snow. After an hour though the brightness increased and we had an almost perfect mix of light, colour, and shade …very atmospheric and ideal for my purposes. I was trying to take photos that would give me starting points for paintings and that recorded some of these amazing colours and patterns. 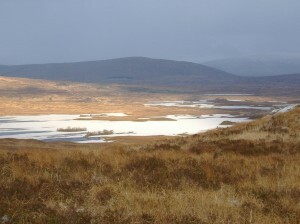 The lochs were quite amazing as they were mostly frozen and covered with the fine layer of snow that was falling. They stood out clearly against the darkness of the heather and peat. And the sun was warm enough at times for me to stop and spend 20 minutes or so doing some sketching. So then, it was a great little day. I’m just a little bit fitter, I have lots of ideas for new work and I experienced the Highlands at their very best ….all within a short distance of a main road. It’s a wonderful landscape. >> Next Post: Happy Almost Christmas!